The April 9th tornado that tore through the northern Illinois region claimed two lives, devastated the small community of Fairdale and caused frightening damage in a number of towns. But NIU meteorology professor Walker Ashley points out it could have been much worse and even more deadly if the EF-4 tornado— with winds of 200 mph and a girth as wide as seven football fields are long—had taken a different path. 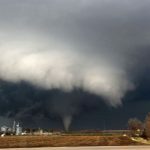 Ashley will examine several different scenarios that could have played out as part of a public symposium on tornado and weather preparedness sponsored by the NIU Department of Geography, which oversees the university’s undergraduate meteorology program. Titled “Gone with the Wind: Providing Perspective on the April 9th Tornado,” the symposium will feature talks by weather and emergency-response experts. It will be held from 7 to 9 p.m. Thursday, April 30, in the auditorium of Montgomery Hall. “The recent tornado was an eye-opener for our region, which hadn’t experienced a violent tornado in quite some time,” said Andrew Krmenec, geography chair. “The truth is that our homes and businesses are at risk from tornadoes and other forms of severe weather. And while homes and businesses can be rebuilt, lives are irreplaceable. 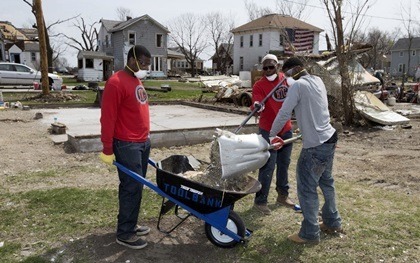 Members of the NIU football team assist with cleanup in Fairdale. Ashley and his Ph.D. student Stephen Strader will be among the featured presenters. The two assisted the National Weather Service in its post-storm survey. Among the almost unbelievable damage they saw: a nearly 100-year-old concrete grain silo reinforced with rebar that had been sent aloft, rolled and destroyed north of Rochelle. 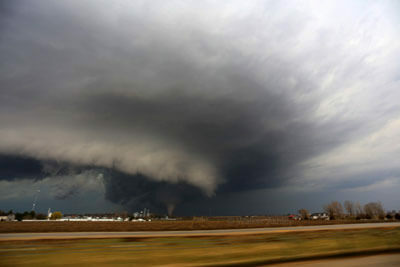 Ashley also had a front-row seat for the main weather event, capturing a series of stunning tornado photos. “The April 9th tornado went through largely rural areas,” Ashley says. “If the tornado shifted about 12 miles northwest, it would have gone through the Byron (nuclear) power station, posing a significant hazard, or had it been a hair south, it would have run through more populated Rochelle. If the storm tracked even farther south, it might have hit DeKalb and Sycamore, with a population of roughly 100,000 people. And had it been closer to Chicago, the number of homes and people affected would have been immense. “People have a false sense that tornadoes only happen in rural settings, but nothing could be further from truth,” he added. 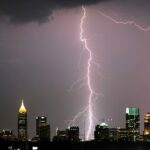 As evidence, he points to Minneapolis, Atlanta, Springfield, Mass., Huntsville, Ala. and Raleigh, N.C. Just within the last decade, tornadoes have struck downtown areas in those cities. In Illinois, the 1967 Oak Lawn tornado and the 1990 Plainfield tornado are reminders that the Chicago metropolitan region is not immune to tornado threats. And Kyle Ullmark, emergency management coordinator for the NIU Department of Police and Public Safety, on the emergency response. For more information, contact the NIU Geography Department at (815) 753-0631.